An FX monster with a great delay section. A shame about the filter's fixed resonance. Analogue-style delay circuit is perfect for FX. Fixed resonance on the awesome filter. Even more surprisingly, was such a forward-thinking company really basing parts of the circuitry on designs found in their MS-10 and MS-20 synths of the 1970s? The hype turned out to be true and - despite its quirks - we loved the original Monotron, fiddly ribbon controller, noisy output and all. "For such a simple unit, there's a surprising range to the effects which can be created and the results are excellent." The Delay is based on the same form factor as the original, right down to the position of the five knobs and three-way slider switch on the front panel. Both Duo and Delay feature the same basic setup - ribbon controller, integrated speaker, headphone output, auxiliary input and compartment on the back for the supplied pair of AAA batteries. 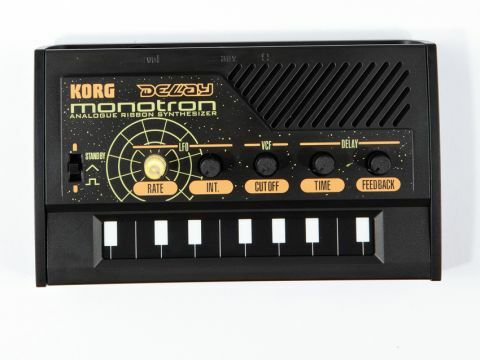 The Monotron Delay's name should immediately give away its unique selling point. The main attraction here is that Korg has crammed a small but perfectly formed delay circuit into the Monotron's case, but there are a number of other small changes. The VCO produces the same reverse sawtooth wave as the original Monotron, but the LFO now offers a square wave in addition to the original model's standard triangle. The LFO is used to modulate VCO pitch and can't control filter cutoff. The four-octave range of the ribbon means that the Delay is practically impossible to play melodies on with any degree of tuning accuracy. This version of the Monotron seems to be designed specifically for FX, with the analogue-style delay circuit playing a major role in sculpting the sound. Delay time is adjustable from a few milliseconds to around one second. The feedback control can effectively bypass the delay at its lowest setting, but turning it up moves gradually from tight slap-back echoes to dub-style spacey, never-ending repeats. With the delay time at its shortest setting and feedback around half way, the unit can even produce a twangy sound similar to a spring reverb. For such a simple unit, there's a surprising range to the effects that can be created, and the results are excellent. A quick look inside reveals that the delay is based around Princeton Technology Corporation's cheap PT2399 echo processor chip. In true Monotron style it's not particularly quiet, with high feedback settings resulting in a rising swell of white noise along with the signal, but for a special effect tool it's not really a problem. Plenty of old analogue delay units are noisy, and it didn't do them any harm. If you're looking for clean delays, the Monotron's not for you, but you'd be missing the point. This is meant to be dirty and nasty. The auxiliary input will even enable you to add a bit of filth to external signals. Surprisingly, the one weakness of the Delay is its filter section. The feedback control feeds the delayed signal back into the filter for extra tone shaping before it hits the delay circuit again, but the only adjustment comes in the form of a cutoff control. Given that the MS-20-based low-pass filter was the main selling point of the original Monotron, it's very surprising to find that the version included on the Delay omits the 'peak' (resonance) control. The MS filter really comes alive as the resonance gets cranked up, turning from a mild-mannered tone shaping control to a self-oscillating monster at higher levels. The only logical reason I can see for its absence is that the Monotron front panel and PCB are designed for a single slider switch and five rotary pots. Adding resonance to the Delay's filter would therefore mean ditching one of the other controls or retooling to produce an entirely new case and PCB design. It's a real shame it's not adjustable as standard, but I have no doubt that the modding and circuit bending communities will come up with a solution before too long. I'm absolutely certain that Monotron owners will decide to add one or even both of the new models to their collection. The Delay is the more immediate of the two units, but gets marked down slightly on versatility since it's really a dedicated FX box.